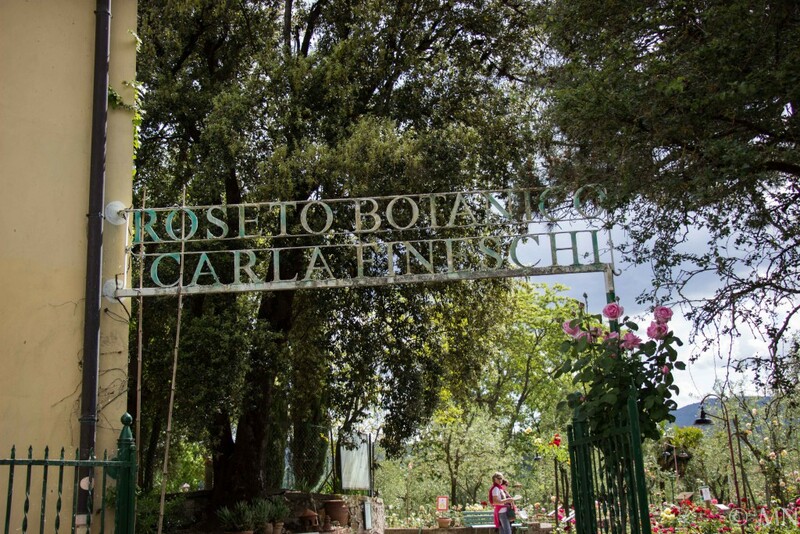 Translation of the essay about my visit in May 2014 to the Roseto Botanico “Carla Fineschi”, published in the January 2015 issue of ‘Rozenbulletin’, the periodical of the Dutch Rose Society. Roseto Botanico “Carla Fineschi” was created in 1967 by Professor Gianfranco Fineschi (1923 – 2010) on his family estate in Casalone (near Cavriglia); it is the world’s largest private rose garden, which collects more than 6.500 different rose varieties and species on just over 1 acre of land. 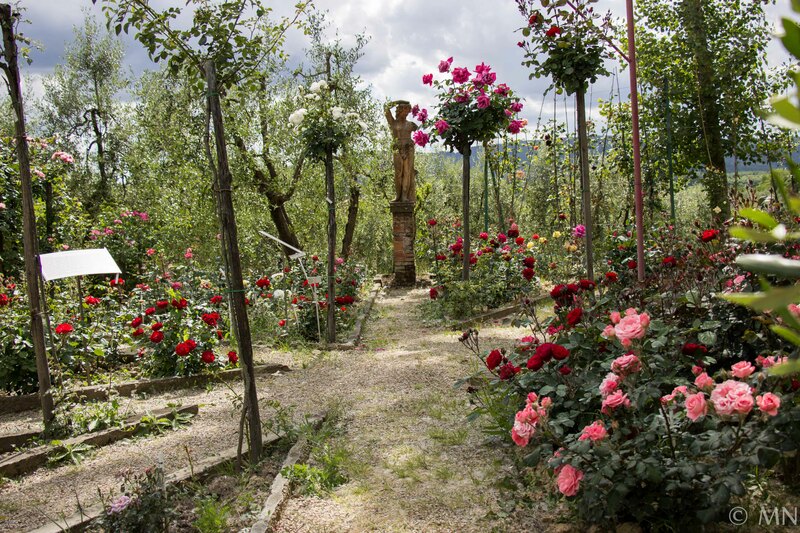 The rosarium is about 50 kilometers south of Florence in the beautiful Tuscany. A “living museum” with a unique collection of ancient and modern roses from around the world. The garden is open from the first Sunday of May to the last Sunday of June. Rolando Zandri, former curator of the Roseto Comunale di Roma writes in the Bolletino della Fondazione Roseto Botanico “Carla Fineschi” (special issue of December 2011, published after the death of Fineschi) how, in the spring of 1969, he received a phone call from Fineschi, in which he expressed his desire to know more about the roses and the catalogue of the above rose garden. Fineschi consulted the catalogue and underlined some hundred varieties, of which he desired having budwood. These were Tea, Polyantha, Floribunda and Hybrid Tea varieties. Towards the end of July, Zandi took the budwood to Cavriglia to be grafted by the nurseryman Sergio Tamburini. It was the first time he visited the Roseto and immediately a working collaboration came into being, which lasted some fifteen years. 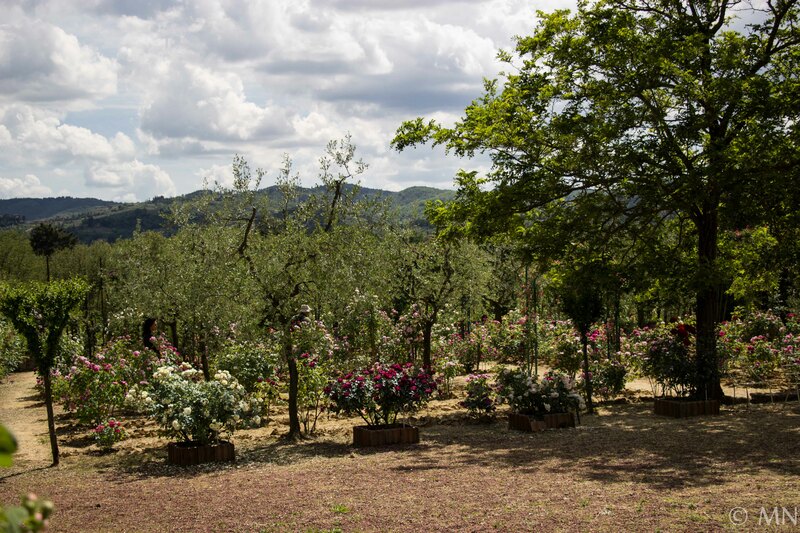 At the beginning of the 70s, thanks to the generosity of the Duke Nicola Pironti, a rose breeder between the years 1963 and 1981, a number of new varieties were sent to Cavriglia. The collection increased continuously and was visited, but above all, admired by rosarians from within the country as well as foreigners. Whilst Zandri supervised the Roseto di Roma between 1962 and 1986, and with the agreement of his municipal director, each year around twenty varieties, duly labelled, were consigned to Fineschi. This totaled around 500 plants. Hella Brumme, former director of the Europa-Rosarium Sangerhausen, writes in aforementioned Bullettino, that since the foundation of his rose garden Fineschi quickly established a consistent collection from around the world. 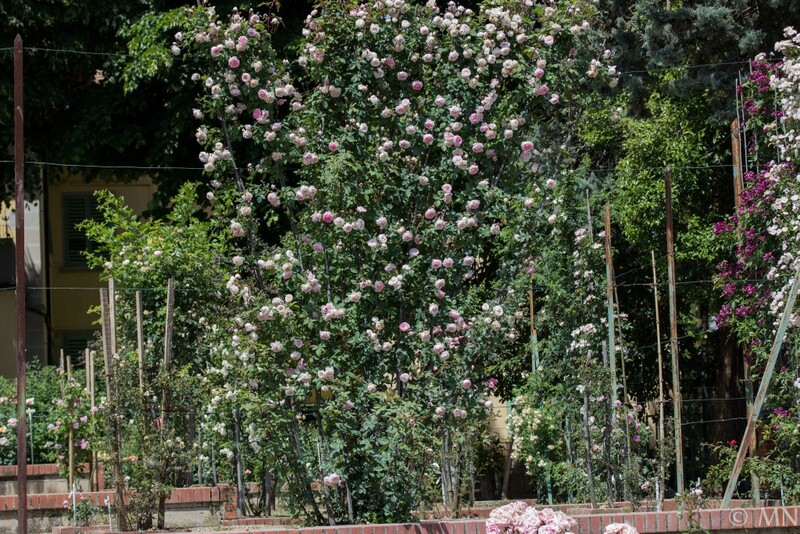 During the early seventies, he took up contact with the Rosarium Sangerhausen where, since 1903 there had been a unique collection of roses, whether judged by size or by content. Because of the difficult political situation of the DDR, it was very difficult to make contact with the rose specialists in Sangerhausen; in fact the director of the Rosarium was forbidden to have any correspondence with foreigners. The head gardener at the time, Paul Täckelberg, who was responsible for the collection, managed to get around these rules and privately exchanged material for reproduction with the Professor. Fineschi received many historical varieties from Sangerhausen, but also new varieties which had been created in Eastern Europe, which he included into his collection. These contacts were however very irregular as contact with occidental countries could have had serious consequences for Täckelberg. Immediately after the fall of the Berlin Wall, official contacts intensified, the Rosarium Sangerhausen was recognized as the Europa-Rosarium and many friends were able to visit it. Hella Brumme took over the responsibility of the collection and the exchange of plants could be organized in a simplified fashion. Thus Fineschi sent many varieties roses to Sangerhausen, above all Hybrid Teas dating from the period 1950-1970. From Sangerhausen many historical and also modern varieties were sent to Cavriglia. After the WFRS Conservation Committee Conference in 1999, the collaboration between Fineschi and Sangerhausen was further intensified, in which the two rosaria reinforced each other. In Sangerhausen there were plants which had suffered due to the severe climatic conditions. Fineschi made the suggestion that these, often rare varieties, should be established in warmer climates, such as Tuscany. Taking in account that there were also other unexpected risks, the varieties would be given a greater chance of survival if they were plants in several different countries. 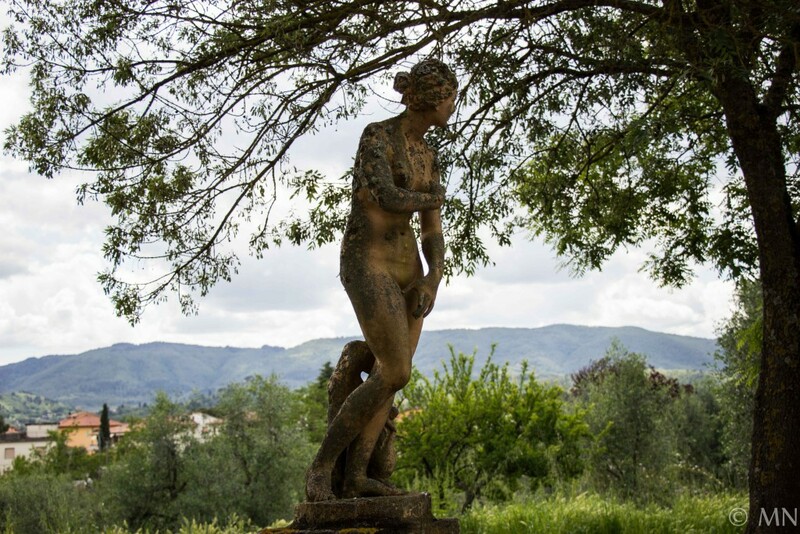 Thus, in both gardens it was decided to maintain reference collections and the concrete agreement to exchange material was agreed during the following meeting in 2000 in Cavriglia. This agreement was taken up very seriously by Fineschi, in fact he always sent one or two plants to Sangerhausen every time he received varieties from Sangerhausen. In this way the varieties from Cavriglia become part of the Sangerhausen collection. To my shame, I must confess that I only heard about the Roseto Fineschi some two years ago for the first time, but I got very curious about it after pictures I saw and stories I heard from friends who had been there. 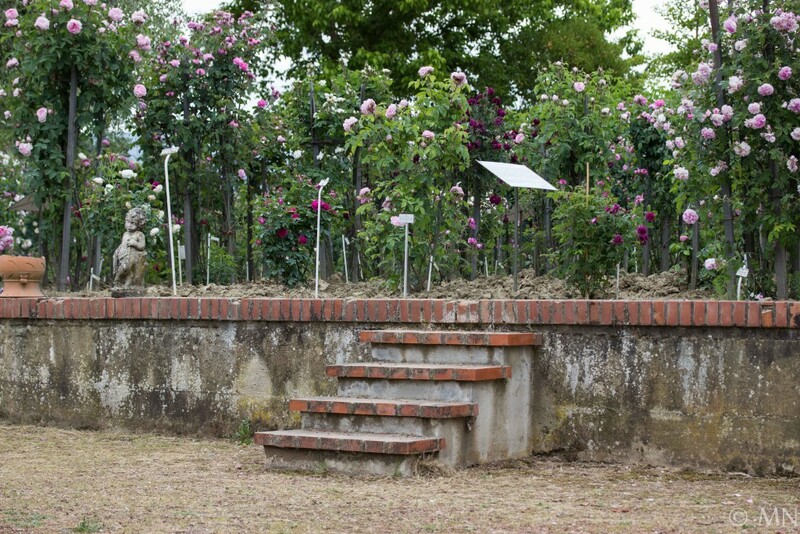 Because I’m writing a book about all the moss-roses and saw that many of these old varieties, besides in Sangerhausen, are also planted in the garden of Cavriglia, I decided to go to Italy in May 2014, visit the Rosarium and do research. From Florence it is by car only a short drive to Cavriglia and thanks to the Internet, hotel, flight and car were quickly booked. 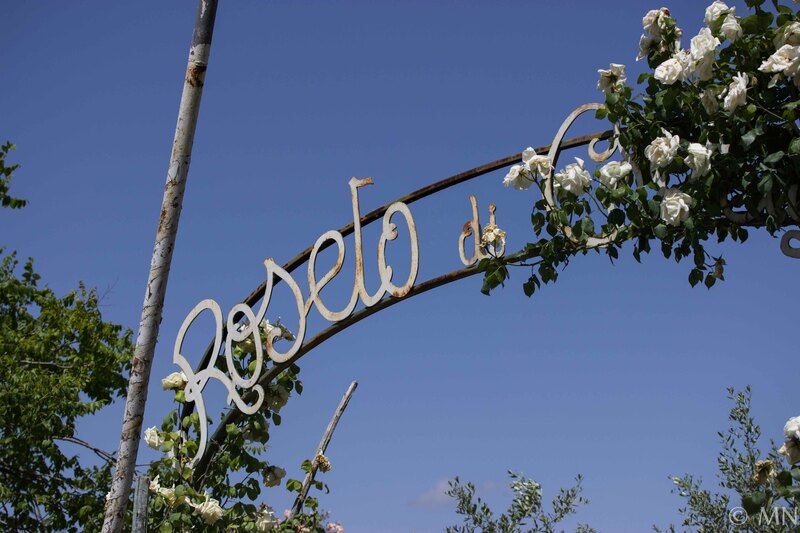 I had found a not too expensive hotel near Cavriglia and on Sunday, May 18th, the first day after my arrival, I went on my way, looking for the Roseto. Navigation in Italy is unfortunately not very reliable, but after some driving around in Cavriglia I eventually saw the signage signs to the Roseto Fineschi. The route to the Roseto is breathtaking across narrow steep mountain roads and right at the top of a mountain a narrow path leads to my destination. Under old trees is space to park the car and the entrance to the garden is just a few steps ahead. On the left of the entrance there are several old buildings where there used to live (and perhaps still do) season workers. At the entrance is an old table with some brochures, books and photographs, with behind it an even older man. With hands and feet (unfortunately I don’t speak Italian) we communicate and for a few euros I buy a ticket. There is a rose festival that day, with music and other festivities, where many people are expected to come, so I decide to use the early morning for quietly roaming around the garden. My first impressions are the overwhelming scent and color of the different roses. The garden looks spacious, although the roses are planted close together and many plants are tied to small wooden poles with willow branches. There are many paths, terraces and terracotta sculptures. Old olive trees and other large trees stand between the roses and everywhere there are chairs or benches that invite the visitors to sit and enjoy the surroundings. Small green lizards run away, but if you stand still for a while, they come out again and let themselves be seen again and photographed. It is wonderfully quiet (I’m still early; the big crowd is expected later in the day). and the song of birds and peacocks sounds everywhere. On the old wall there are plates with texts like “Come into my garden, I would like my roses to see you”, Richard Bringsley Sheridan and “I don’t know whether nice people tend to grow roses, or growing roses makes people nice”, Roland A Browne. 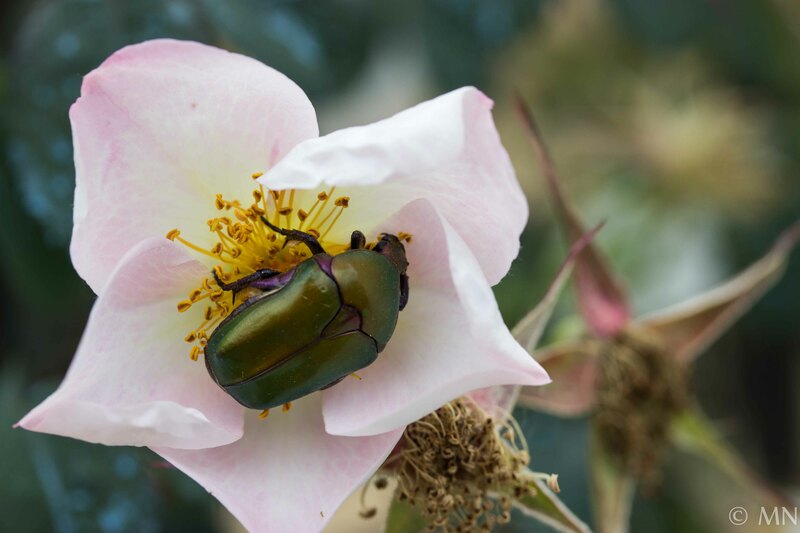 Obviously I can’t wait to see the moss-roses, so I barely have eyes for the many roses that are in the garden, but their numbers are overwhelming, especially on the – relatively – small space with so many different varieties. It is almost impossible to comprehend how special this huge collection is. At the very end of the rose garden, close to the main house (the house of Fineschi?) 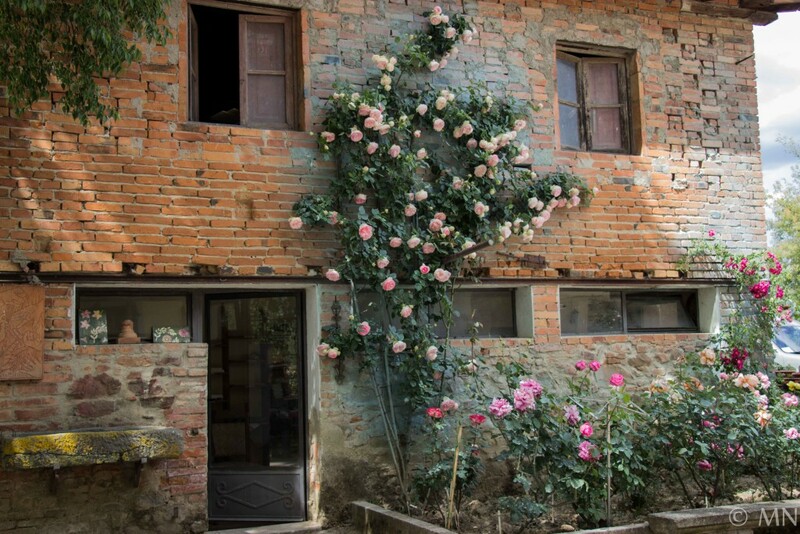 is the section with the historic roses and on a beautiful elevated terrace, bordered with terracotta stones, I find my beloved moss roses. I experience surprise after surprise and enjoy full heartedly a sea of fragrant flowers. 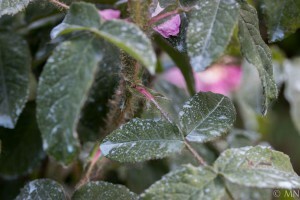 The next day I’m back early; it is a cloudy day and photographing and describing the different moss roses takes time. At a quarter to two I take a short break. Around four thirty it is starting to rain, which is a good reason for me to stop and go back to the hotel. On Tuesday, May 20th, I had a meeting with Antonella Fineschi, one of the daughters of Gianfranco Fineschi. Through mutual friends she was informed of my planned visit and she was kind enough to receive me and tell me more about the work of her father. It was a hot day and in the shadow of the old trees and under a big umbrella we had a nice conversation about the different roses, our own favorite roses, the responsibility and the associated problems of inheriting a private rose garden (without subsidies) and common rose friends. Before it got too hot I again spent a few hours in the garden to photograph even more moss roses and make notes. After that time, I was sure I had found all the different moss roses to describe and could turn my attention to all the other roses and the environment, but to my surprise the next day I discovered at a remote section of the garden yet again some special moss roses. Of the four, full days in the garden I spent three and a half at the historical roses section (moss roses, centifolia’s gallica’s alba and Bourbon Roses). The first two days were cloudy, but with a decent temperature of 27 to 30 degrees Celsius. 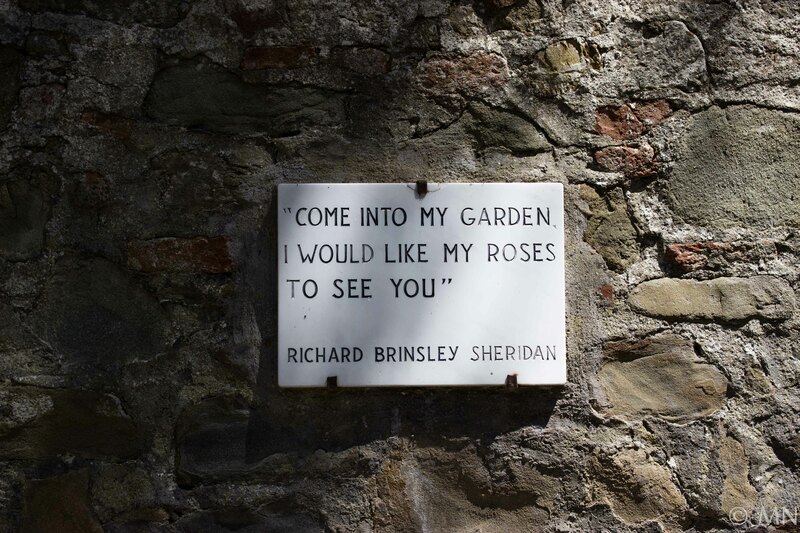 On the -very sunny and warm – third day I noticed that the moss roses started to fade because of the heat and I was happy to have planned my visit exactly on the right time. 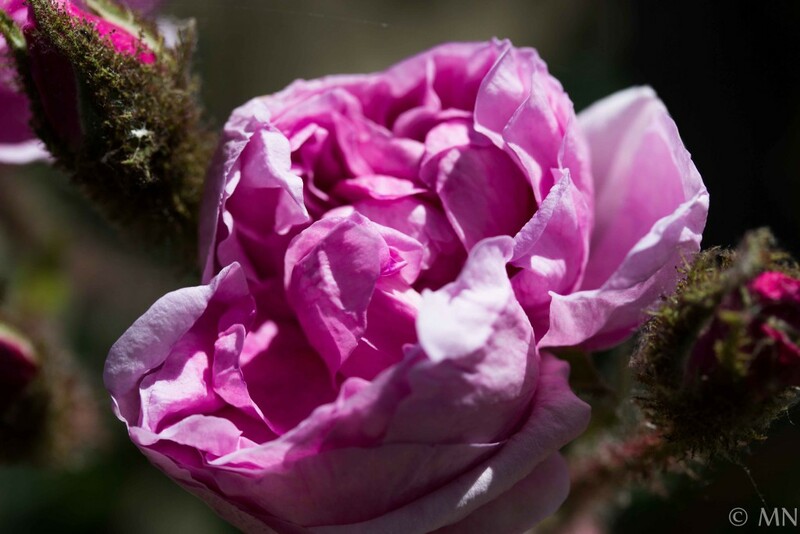 Noticeable is that some moss roses, especially those with large silky flowers appear to do better in Italy than in the Netherlands and Germany. I have never seen the flowers of ‘Mme Louis Lévêque (Louis Lévêque & Fils, 1898) so beautiful and perfect. In my own garden the flowers often ‘ball’ in the rain and here I saw her for the first time in its full glory with huge, perfectly shaped flowers. But otherwise, I feel that most of the moss roses benefit more from the climate of Northwest Europe; because of the cooler temperatures the flowers there remain longer on the plant. 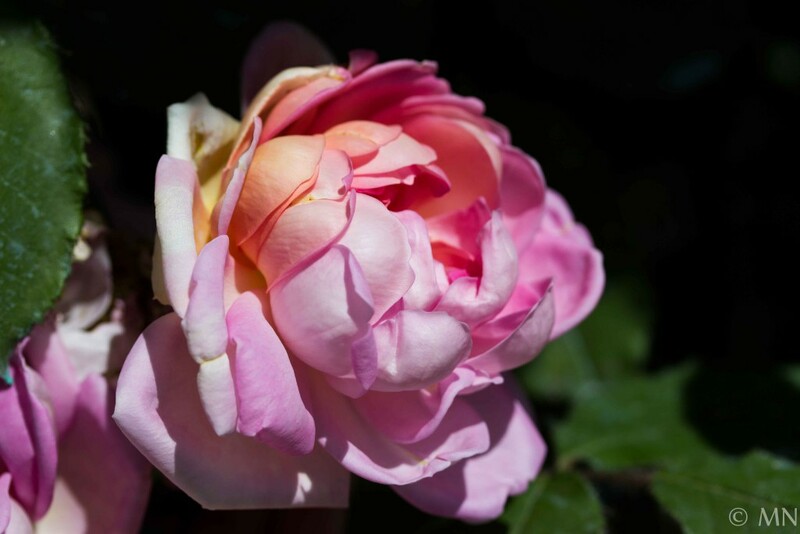 Hybrid Teas are of course a different story; they benefit greatly from the Tuscan sun and show off their enormous flowers. The roses in the garden are planted by group and near the entrance there is a plan that helps to determine your route. There is a very large collection of modern roses from growers from all over the world, such as Lens, Kordes, Harkness, Buisman, Leenders, Mc Gredy, Meilland, Poulsen, Noack, Beales, Austin, Dickson, Verschuren and many more. I found about 83 different moss roses in the Roseto, some varieties still ‘new’ to me. Along with the large collection of moss roses in Sangerhausen (some 130 different varieties), I now have seen and photographed about 149 different moss roses, which is about a minor one/third of all ever grown moss roses. I was very happy with the discovery in Fineschi of, among others ‘Mme Platz’ (Moreau-Robert, 1864), ‘Mme Soupert’ (Robert & Moreau, 1851), ‘Oscar LeClerc’ (Robert, 1853), ‘Pélisson’ (Vibert , 1849) and ‘Robert Léopold’ (Buatois, 1941). Unfortunately, in the course of time -despite all the efforts – some 600 different varieties disappeared from the garden. The Dutch organic rose nursery De Bierkreek was saddened about the loss of these rare roses and for some years now aids the Roseto to restore the collection in a worldwide search for lost species. Thanks to the help of rose lovers from all over the world, some of these lost varieties where found and the nursery was able to reproduce them. 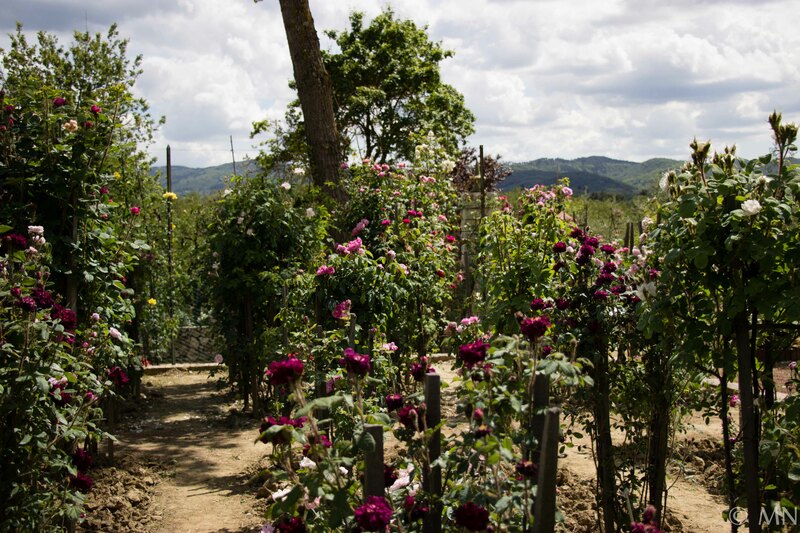 Also the Roseto and the nursery have started an exchange, in which every year budwood (often the last twig) of roses that are barely alive in the Roseto, is sent to the nursery. 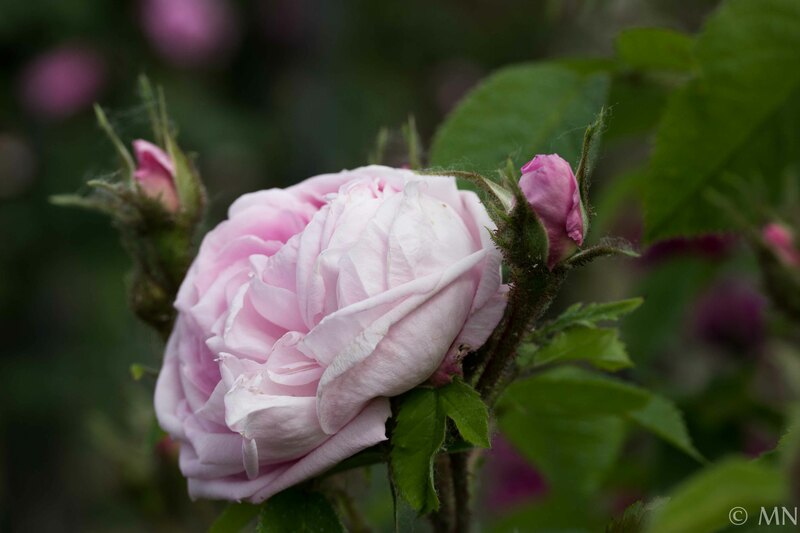 After grafting the budwood one or two plants are sent back to Italy the next year, with the positive result that now some very rare roses from Fineschi are growing in the garden of De Bierkreek. In the catalogue Le rose del roseto botanico. “Carla Fineschi” in Cavriglia (Arezzo, Toscana). Catalogo tassonomico del patrimonio botanico (English edition, Piccin, 2000 ISBN 10: 8829915343 / ISBN 13: 9788829915347) most of the roses that are planted in the Roseto (or have been) are listed. An interesting book about Roseto Fineschi and Fineschi himself, is the previously mentioned bollettino of December 2011, in which responses from the rose world are collected on the death of Fineschi. It is a multilingual (mainly Italian/English) book that – as far as I know – can only be bought at the Roseto. Of course I bought a copy of this particular book during my visit. 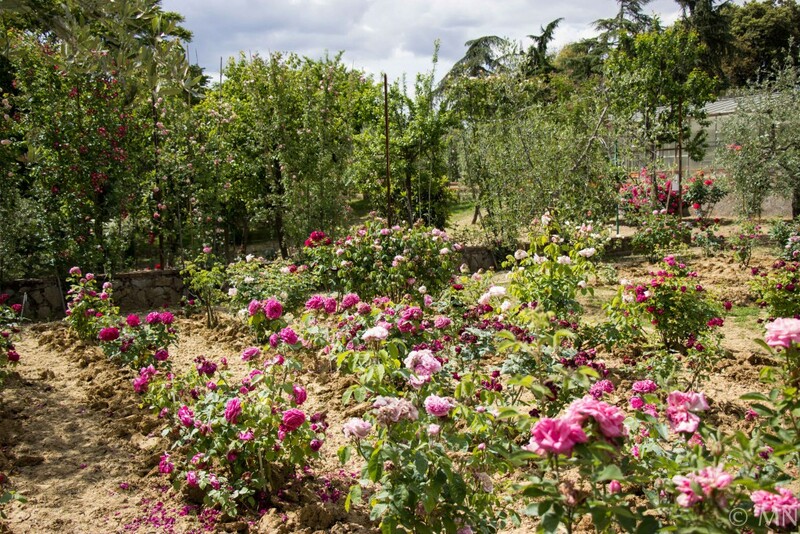 The Roseto Fineschi is truly a garden that – as the Europa-Rosarium in Sangerhausen – every lover of roses must have seen and experienced. Indeed, a living museum where many rose varieties are preserved. The impressions are huge and hard to describe; the sun, the light, the heat, sounds, smells, buildings, people, animals and the environment, make it a unique experience. It is almost impossible for me to understand how one person (with the help of others, of course) was able to create this place. Every rose lover can surely find here his or her favorite rose, or rose-group. * Bordeaux mixture (also called Bordo Mix) is used as a fungicide. The mixture is prepared by the neutralization of 2 parts of copper sulfate with 1 part of slaked lime in 100 parts of water. Bordeaux mixture was originally used in wine regions by farmers, who treated their grapes with blue vitriol to make the grapes less attractive to thieves. Nowadays it is used in vineyards, fruit-farms and gardens to prevent infestations of downy-mildew, powdery mildew and other fungi. It is sprayed on plants as a preventative; its mode of action is ineffective after a fungus has become established. The amount of copper that can be sprayed in vineyards and the maximum amount of copper in the soil is subject to legal limits in France. The regular use of the agent in vineyards leads to accumulation of copper in the soil. If it is applied in large quantities annually for many years, the copper in the mixture eventually becomes a pollutant. Bordeaux mixture has been found to be harmful to fish, livestock and—due to potential build-up of copper in the soil.